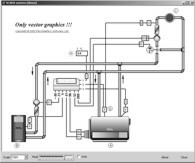 FlexGraphics - is a set of components for creating vector graphics applications under Borland Delphi (CAD, GIS, SCADA, VISIO). 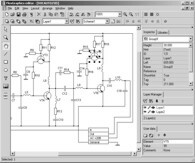 FlexGraphics library can be used for creation of plots, drawings, electrical, concept and mnemonic charts as well as for creation of interactive plans with high level of detail for various facilities, buildings or their parts. FlexGraphics library can also be used for visualization of information being received from various sensors in real time. SCADA-systems, GIS-systems and CAD-systems can also be developed using this library. FlexGraphics for Borland Delphi/C++Builder can be called a mini analog for Visio. Moreover the developer gets full control of all objects at run time including the ability to access objects both by ID and by name. User defined fields and values as well as usual or multi-line hints can be specified for each object and are stored in document body. FlexGraphics for Borland Delphi/C++Builder will allow you to build vector graphics capabilities in your software. You will be able to build serious full-featured graphics processing systems with its help. 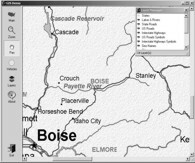 For detailed information about FlexGraphics see Information section. - FlexGraphics v1.80 release !!! Copyright © 2001-2019 by FlexGraphics Software. All rights reserved.